One of the most fascinating cities in Himachal Pradesh, Kinnaur is decked with a number of rivers, valleys, lofty peaks, lakes, and lush greenery. You can witness various colorful festivals that are celebrated here round the year. Kinnaur is also a nice place for shopping, as you can pick up some excellent handicraft items and fruits here. A perfect destination for trekking, Kinnaur should be ideally visited between the months of April and October. 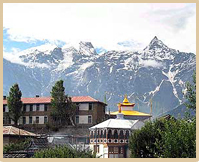 Come on a tour to Kinnaur, and you will have an unforgettable experience exploring this beautiful city. Kalpa :- This heritage village houses the magnificent Narayan-Nagani temple and a couple of Buddhist monasteries including the Hu-Bu-Ian-Car Gompa. Reckong Peo :- Situated 2670 m above sea level, this place provides a spectacular view of the Kinner Kailash peak. You will see a 79 feet high rock formation here that resembles a Shivalinga, changing color as the day passes. Kothi :- Eminent for the temple of Goddess Shuwang Chandika, this village is adorned with lush green fields, fruit trees, vineyards, and tanks. The imposing Kinner Kailash peak forms the backdrop to this charming landscape. Moorang :- This picturesque village can be approached through an apricot orchard, surrounded by high mountains on almost every side. There is an old fort here, perched on a hill overlooking River Satluj, believed to be built by the Pandavas. Wildlife Sanctuaries :- There are 3 well-known wildlife sanctuaries in Kinnaur, including the Lipa-Asrang sanctuary, Rakchham Chhitkul sanctuary, and Rupi Bhaba sanctuary. Dotted with multifarious forest types, these sanctuaries provide shelter to several faunal species. Air : The nearest airport is at Shimla (235 km) which can be reached from Delhi. By Road : Well-connected by National Highways-22, Kinnaur can be reached conveniently by availing of jeeps and taxies. If you are about to travel to Kinnaur in the near future, Indian Holiday can help you plan your trip. For a tour to Kinnaur, just get in touch with us for the tour booking, tour packages and more travel information. Moreover, we offer prices that are among the best you can come across during your travel to India.